1mg, Gurgaon-based Healthkart’s online drug search business, has acquired Medd.in, an Mumbai-based platform for booking diagnostic and imaging tests. The other details regarding the deal size and structure remained undisclosed. 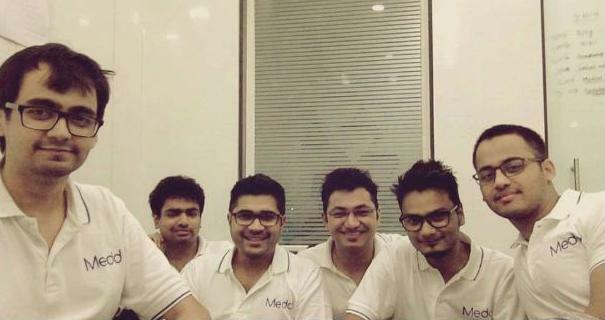 Medd was founded by Arpit Kothari, Anurag Mundhada and Era Dwivedi. Arpit and Anurag will join 1mg team. Medd was launched in May 2015 and was operational across Mumbai, Indore, Bhopal, Nagpur, Bangalore, and Jaipur. It initially began with its app-only pilot in Indore, getting 1000 app downloads within 2 months. It aims to provide patients not only with information on certified diagnostic labs, but also make them aware of the options for choosing and comparing rates. Currently, it has downloads somewhere between 10,000 to 50,000 on the playstore. Medd helped choose between NABL labs based on verified information. The startup had raised its first round of investment in May 2015 from Ajeet Khurana. The second round of $150K was raised from four undisclosed angel investors. In coming years, it was targeting to build its presence in at least 20 cities both organically and inorganically i.e. in partnership with labs. “Together with Medd, we see a unique opportunity to amplify our leadership position and enter new geographies as well as the Radiology segment,” said Prashant Tandon, CEO 1mg. Additionally, 1mg has brought on-board Ankur Gigras, former Marketing Head for Gastroenterology at Abbott. Ankur will be responsible for overseeing the Diagnostics Business and additionally drive innovative patient centric models with Pharma, Insurance and the rest of the healthcare ecosystem. Ankur holds an MBA from Stanford GSB &amp; B-Tech from IIT, Madras. He has worked with McKinsey, Investment Bank William Blair and Abbott Nutrition (where he helped executing their growth strategy in India) in the past. On his move to 1mg, Ankur shared, “I believe 1mg has created an exceptional platform which is engaging consumers at scale in a very unique way. This platform opens up tremendous opportunities to change the way healthcare works – the direct connect with the patients makes the creation of patient centric models a reality; something that has been always discussed across the ecosystem, but could never get off the ground. “We believe given the fragmentation of the industry, the largest platforms will be digital marketplaces as India leapfrogs brick and mortar-based retail” Tandon adds. 1mg (earlier Healthkartplus) was launched in 2012 by Prashant Tandon and Sameer Maheshwari. It was rebranded in April 2015 to operate under 1MG Technologies Pvt. Ltd. The online diagnostic service of 1mg is currently available across 23 cities, powered by tie ups with certified laboratories. Users can book an appointment for at-home sample collection and receive their test results online with the added option of receiving a paper copy. By using the 1mg platform, users can make savings of 40-60% on their lab tests requirements. As claimed by the company, it has over 6 Mn app downloads and 80 Mn annual visits on its platform. It has recently raised over $15 Mn (INR 100 crore) in Series B funding led by Maverick Capital Ventures, with participation from existing investors Sequoia India and Omidyar Network. It also raised an additional funding from HBM Healthcare Investments AG, a global fund catering exclusively to the healthcare sector. In April last year, 1MG had raised $6 Mn from Sequoia Capital, Intel Capital, Omidyar Network, and Deep Kalra, co-founder of travel portal MakeMyTrip. It also acquired an online homeopathic drug startup Homeobuy, which has been rebranded to 1MGAyush. In May this year, it also brought on board Zomato’s chief product officer Tanmay Saksena,as its chief operating officer (COO). According to IBEF report, the overall Indian healthcare market is poised at $100 Bn. It is expected to touch $280 Bn by 2020, growing at CAGR of 22.9 %. Other players in this space include NetMeds, mChemist, DeliMedi, CareOnGo, MediDali , Prato, and more.